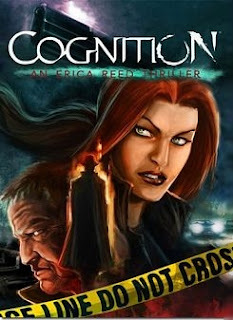 Cognition is an adventure game that stars Erica Reed, an FBI agent in Boston. She develops the ability to see the past when she touches an object during an investigation to find a serial killer who killed her brother. When investigating a crime, she finds messages that hint towards her abilities. So, now someone knows her secret, but she doesn't know who, how they found out, or what they want from her. It was funded through a successful Kickstarter campaign on December 11, 2011. While assigned to a case of a hanged man whose fingerprints were removed, Erica's cognitive powers spiral out of control. After someone close to Erica is kidnapped by a serial killer called The Wise Monkey, she's in a race against time to save his life. The shocking truth of The Oracle's identity is revealed, along with the killer's connection to Erica's own tragic past. Answers are revealed in the finale.